The Tennessee Criminal Defense Attorneys of the Oberman & Rice Law Firm put our clients first — aggressively advocating for them in the courtroom and providing them with special attention beyond the courtroom to help alleviate the anxiety that accompanies Tennessee criminal charges. Our clients can always expect both prompt and thorough communication from our attorneys and staff. 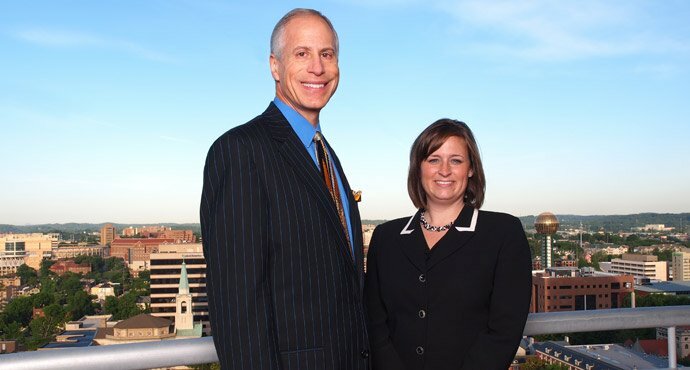 Our Knoxville, Tennessee based Criminal Defense Lawyers — Steve Oberman and Sara Compher-Rice — work tirelessly to defend those charged with Tennessee crimes, including, but not limited to, Assault, Burglary, Conspiracy, Domestic Violence, Driving Under the Influence, Felony Drug Charges, Public Intoxication, Reckless Driving, Reckless Endangerment, Shoplifting, Simple Possession of Drugs, Theft, Traffic Offenses, Underage Possession or Consumption of Alcohol, Vandalism, and Vehicular Assault. Our Knoxville, Tennessee Criminal Defense Attorneys also pride themselves on maintaining the highest ethical and legal standards. 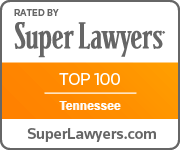 Due in part to the work ethic and dedication of our Criminal Defense Lawyers, the Oberman & Rice Law Firm was ranked by U.S. News & World Report as a Tier 1 Best Law Firm in Knoxville, TN in the practice areas of Criminal Defense and DUI Defense. The renowned Martindale-Hubbell™ rating system has also bestowed the firm with the highest rating for law firms. Additionally, our Tennessee criminal defense lawyers have received numerous honors from many legal organizations, recognizing their exceptional skills. To learn more about the experience and accomplishments of our Tennessee criminal defense attorneys, Steve Oberman and Sara Compher-Rice, please click here. Criminal charges, regardless of whether they are misdemeanors or felonies, may negatively affect you for the rest of your life. If you are convicted of a crime in Tennessee, you will likely be sentenced to some or all of the following: jail time, including mandatory minimum sentencing or sentence enhancements; probation; fines and court costs potentially in the range of thousands of dollars. More seriously, though, you risk a permanent criminal record, which may impact, among other things, your reputation; career; driving privileges; future employment, credit rating; ability to obtain loans; and/or ability to receive an education. These severe consequences of a Tennessee criminal conviction highlight the importance of hiring a dedicated and aggressive criminal defense attorney. The Tennessee Criminal Defense Attorneys of the Oberman & Rice Law Firm will ensure that your rights are protected. The U.S. and Tennessee Constitutions guarantee the right to remain silent (in order to not incriminate yourself) and the right to have an attorney. You should have a lawyer present at all interrogations with law enforcement, as well as all court proceedings, so you do not inadvertently incriminate yourself. Additionally, you should not discuss the details of your case with anyone, even your family and friends. While you have the right to not incriminate yourself, anyone with whom you communicate may be called upon to testify against you. This may include your significant other, siblings, parents, physicians, psychologists and best friends. While certain privileges, depending on the facts, may exist, everyone is under an obligation to tell the truth under oath if they are required to testify. Being convicted of a crime in Tennessee has extremely serious consequences and requires equally serious representation. Your future is our present concern. We have trademarked this phrase because we mean it. If you have been charged with a crime in Tennessee, contact the Oberman & Rice Law Firm immediately. We are available 24/7 at (865) 249-7200. The vision for every lawyer in this firm is to provide clients with the very best client service and representation. We want clients to develop a long-lasting, trusting relationship with us. We are proud to have built our reputation on hard work, not by buying billboards. As evidenced from the many volunteer educational presentations our lawyers make to the general public, defense lawyers, judges and even prosecutors, we are committed to servicing the people of our communities and the legal profession across the United States. While lawyers are rightfully prohibited from promising results, Oberman & Rice does promise you that we will be easy to contact, readily available to discuss your case with you in person, and be not only prepared, but over-prepared to litigate your case. Unlike most law firms, all our lawyers confer regularly at a scheduled meeting to brainstorm about each case. In this manner, we are more likely to ensure nothing is overlooked and to develop innovative defenses. The best results are obtained by working hard – not by chance. We are honored to be recognized by so many organizations as extraordinary lawyers and will continue our hard work and volunteer service as long as the firm exists.